I’ve had the same credit card for many years – basically, since the first time I got a card. It’s served me well, but for a variety of reasons, I’m looking to get another one and let the old one sit empty. It’ll still be useful as a large credit pool, helping my overall credit score + history, but I’m not loving the rewards right now. I’m looking at other credit cards and what benefits they offer, and I started to wonder: what are my options in a credit card that would give me horse-specific rewards? 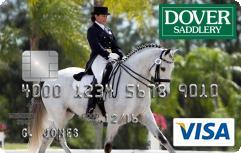 Once upon a time, I had a Dovery Saddlery card. I signed up because it gave me a great signing bonus and I needed/wanted a backup card, just in case. I never really used it, even though it promised rewards. I see that credit card program is still active, but I’m just not sure it would be worth it for the things I can buy at Dover. Now, if there were a SmartPak or Riding Warehouse card with good benefits, I’d be all over that! But alas, nothing yet. Right now, I’m leaning toward an Amazon card, but I’m curious – do you use a credit card with benefits for horse purchases? Which one? I vote yes to an Amazon card; while not specifically horsey, I have purchased a lot of horsey things from Amazon over the last few years, and the new bump in rewards makes it a great card in general. I use the rewards to pay down the balance (since new purchases made with the rewards don't earn points… though I've also hoarded them to treat myself). I used to be able to reap rewards paying my board with a credit card, but now that I'm back at a low tech barn that requires writing checks, I'm not getting those rewards. I'd consider a SP or Riding Warehouse card, but since I'm trying to spend less on my horses… it's probably a good thing they don't exist. Since I have prime, the Amazon card makes sense (though my household is trying to move away from credit cards in general) and has good rewards for general spending as well as Amazon spending. Johnny and I have an Amazon card, and it's…sort of useful. We use it for buying groceries, gas, eating out, and anything we buy on Amazon. At the end of the year, we use the rewards we're accrued to buy Christmas presents for family members. I don't buy much horse stuff anywhere other than work or the local feed store, so I can't speak to Amazon's selection or prices! I have the amazon card too. We do tend to purchase a lot of things off Amazon, and with the increase (5% for prime members) recently, it helps. While I don't buy a lot of horse things on Amazon, I figure those points are freeing up other money that can be used on horse things. I have two credit cards that I consistently use – one for airline miles and travel discounts, and one for everyday purchases. My airline mile is $1 per mile, and I've saved enough miles on it to go to Japan this spring. It also allows me a free checked bag with American, which I've used a lot. My 2nd card is 1.5% cash back through my bank, and super handy. Basically what I'm saying is that I have yet to see a horse card that gives me benefits anywhere near as good as my travel/cashback cards. I just have a good cash back card I use for everything. I've never been one to get store-specific cards. I just have a regular card that gives me cash back. I live for airline miles cards! The deals are not as good as they used to be, and you need be flexible about when you fly (such as a 7am flight or one that gets you home at 1am) but I can't imagine living without one now. I had an Amazon card years ago, but but I ended up with a few hundred dollars in amazon bonuses, where as spending the same amount I can get almost $1,000 worth of flights for the same spending. I do only have one card and I do change it every other year to get the bonus miles, but it works really well for me. Good luck!